Growing up farming in a remote mountain valley in British Columbia, Canada, Susan’s early years were steeped in discussions, often heated, between organic gardeners, environmentalists, conventional farmers, and loggers. Intending to (eventually) go to vet school, she completed a BSc in ecology and MSc in evolutionary biology, and ended up focusing on infectious diseases. These studies opened the gates to field research in Costa Rica, Amazonian Peru, western Canada, and East Africa — in addition to bioinformatics and mathematical modelling. Throughout it all, her goal has been to find ways to tie together ecological restoration, global health, and food security, which in 2012 led to a Permaculture Design Certificate in Jordan. 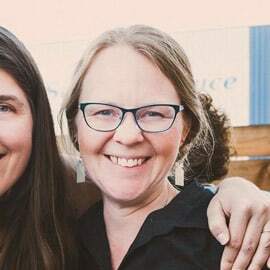 Since then, Susan has worked on farms (pastured pigs and poultry; organic fruit and berries); collaborated on design and installing edible landscapes; in nature-based youth education; and in her own company in research and design. After completing the REX/Regrarians training with Darren Doherty (2016) and becoming involved with Slow Food USA, she is increasingly focusing on tying nutrient density, gut health and soil testing together in a practical framework that supports locally regenerative food systems while directly addressing impacts on common disease risks, both infectious and chronic. She teaches in Quail Spring’s Resilience Development PDC, and is driven by learning and discovering more and more practical approaches to addressing big world health problems.